IDENTIFY THE DOCTRINE (hearing a story): Tell the following story: “When President James E. Faust was a child, he had a nightmare and woke up crying. His grandmother hugged him, comforted him, and told him they were safe because Jesus Christ was watching over them. He went peacefully back to bed, assured that Jesus does watch over us.” Tell the children that this experience helped President Faust gain a testimony of Jesus Christ (see “A Growing Testimony,” Ensign, Nov. 2000, 53). ENCOURAGE UNDERSTANDING (playing a game): Create 10 wordstrips describing things that will help someone gain a testimony and a few others describing things that will not (sample wordstrips – pdf). Place a long rope or string with 10 knots in it on the floor. Ask a child to stand at one end of the rope and hold a sign that says, “A Testimony of Jesus Christ.” Invite another child to stand at the other end of the rope with a sign that says, “I Can Gain.” Let a child pick one wordstrip and read it out loud. If it describes something that will help us gain a testimony, have the child with the “I Can Gain” sign step forward one knot; if it does not lead to a testimony, have the child stay in place. Repeat until the child reaches the other end of the rope. Have everyone say, “I can gain a testimony of Jesus Christ.” Explain that our testimonies never stop growing; as we continue to follow Jesus Christ and make right choices throughout our lives, our testimonies will continue to grow stronger. Sharing Time Ideas from Little LDS IdeasI saw a great idea from The Friend (Feb.1991) that I am using for my idea this week. Ask the children if any of them remember the song, “The Wise Man & The Foolish Man” (cs 281).Where did the foolish man build his house? And where did the Wise Man build his house?If you were going to build a real house to live in, who would you build your house like, the wise man or the foolish man?You would want to build your house on a firm foundation of rock or cement so that when the wind blew, the rain fell, or a flood came, the house would be protected and safe. Many times in the scriptures, gaining a testimony is compared with building a house upon a rock. Today we are going to discuss how we can gain a testimony, but we want to make sure our testimony is strong and built on a firm foundation. So we will be building a ‘testimony house’.Each block of our ‘house’ will have a short phrase on it that you will need to decide if that is something that will help our testimonies to be strong or not. Attach each word strip to a block. To PlayHave your blocks hidden around the room or in a bag/container. Invite a child up to the front of the room to pick a block. Have them read the phrase on the block and then decide if it’s something that can help us gain a testimony. If it is have them begin building the ‘house.’ If it’s not something that will help us gain a testimony have them place it in a bucket.As the blocks are chosen discuss how that can help us gain a testimony. Continue picking/finding blocks until all blocks have been found.As you end your Sharing Time tell the children that as we do things to gain a testimony and to strengthen it we will be able to withstand any rain or floods that may come into our lives, because our testimonies are strong we will be able to Choose the Right! Another Way to PlayYou could also have pictures on each block to represent ways to gain a testimony, or a word and have the children act or draw clues to have the other children guess what it is. 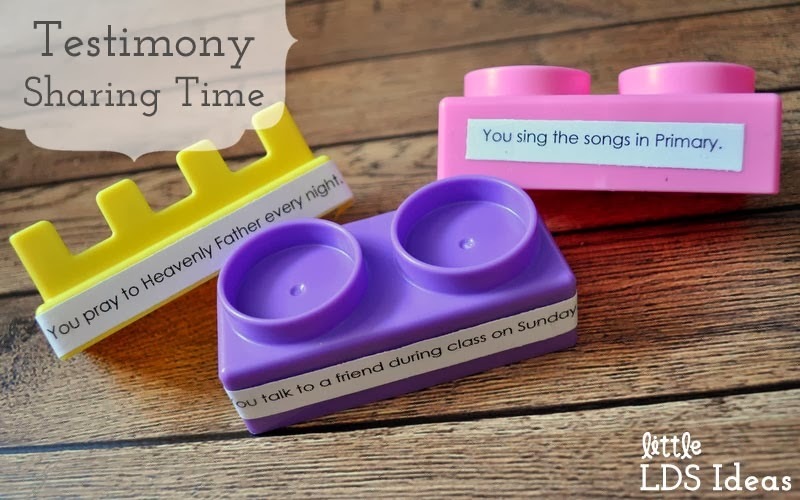 Sharing Time Idea from Latter-Day ChatterHere’s another idea that you could use for this week’s Sharing Time. Just visit Latter-Day Chatter, HERE, to view Jessica’s idea and to print it out. That’s it! I hope you like my “Testimony House” sharing time idea. If you use it I would love to hear how it goes or any changes you made.Thanks so much for stopping by. Have a wonderful day & a great Sharing Time.